Hickory County, named after President Andrew Jackson's nickname, Old Hickory, is a pretty small county in size and population, with only about 9000 residents. 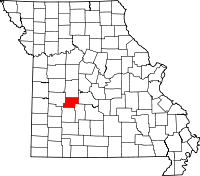 The Hickory County Historical Society operates a Museum and Research Room in the county seat of Hermitage, MO. The museum itself is in a building that was built in 1855 and is on the National Register of Historic Places, and it has a number of records available for research there, including marriage records from 1872 to 1945, local cemetery records, and others. Also in Hermitage in the Hickory County Courthouse is the Circuit Clerk, who also acts as the county's Recorder of Deeds, and as such, is responsible for all maintaining all records in the county except for births and deaths. Those last two are handled by the Hickory County Health Department in Hermitage along with the other offices.